Abra cadabra! Bad trait(s) be gone! 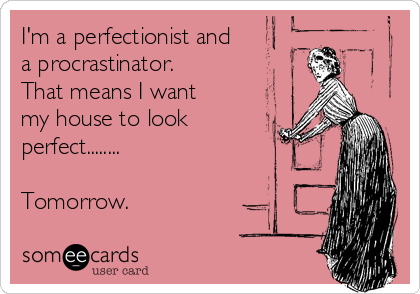 Okay, just for a moment, we’ll totally set aside indecisiveness as a trait I want need would like to change, and I’ll tell you that I’m torn between two other things: perfectionism and procrastination. In my opinion, these are two of my worst qualities, and I’ve owned up to them before. According to any decent 12-step program, this is a crucial first step toward recovery. But it doesn’t seem to help in the least that I am fully aware of and freely admit to both weaknesses. Despite numerous attempts and various tactics, I’ve been unable to noticeably alter either characteristic. Occasionally I experience a small victory in one arena or the other, but some days I honestly think the perfectionism is getting worse. I wish I could wave a magic wand and get a handle on this pair of problems once and for all. Maybe it’s time to locate a sponsor who can help me examine past actions and move forward with a new code of personal conduct. Or is it too late to teach an old dog new tricks?